NORTH KOREA HAS launched three short-range missiles into the Sea of Japan, apparently as part of a military drill, South Korea’s defence ministry said. US and South Korean forces had been on heightened alert for a medium-range ballistic missile test in recent weeks amid tensions triggered by North Korea’s nuclear test in February. “North Korea launched two guided missiles in the morning and another one in the afternoon,” a defence ministry spokesman told AFP. “The missiles landed in the East Sea (Sea of Japan),” he said. South Korea was maintaining intense surveillance of the North and keeping a high-level of readiness to deal with any risky developments, he added. North Korea sometimes launches short-range missiles for tests or as part of military drills. “A more detailed analysis will be needed but the missiles launched may be a modified anti-ship missile or the KN-02 surface-to-surface missile derived from the Soviet era SS-21 that has a range of about 120 kilometres,” a Seoul official told Yonhap news agency. The launches followed a joint South Korea-US naval exercise this week, slammed by North Korea as a “wanton” provocation and rehearsal for war. 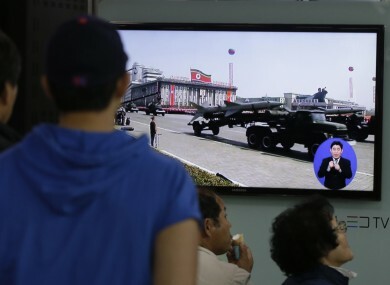 A US defence official said last week that two North Korean Musudan medium-range missiles that had been primed for firing as tensions flared in the run-up to the North’s national celebrations on April 15 had been moved from their launch site. Musudan missiles have an estimated range of 2,500 to 4,000 kilometres (1,500 to 2,500 miles), enough to reach South Korea and Japan and potentially US military bases on the Pacific island of Guam. US and South Korean officials had been worried that any test of the medium-range missiles would trigger a fresh surge in tensions, which escalated after the North carried out a nuclear test in February. UN sanctions imposed after the test triggered a cycle of escalating military tensions on the Korean peninsula that are only now beginning to subside. Email “North Korea launches three short-range missiles ”. Feedback on “North Korea launches three short-range missiles ”.